Preliminary studies revealed that the world wide web (WWW) system is successfully adopted in a control survey of morphological laboratory tests, in which slidefilms have been used conventionally (Fig. 1), with advantages of much easier access, great reduction of costs and stability of images through duplication and transportation (Fig. 2, Fig. 3). 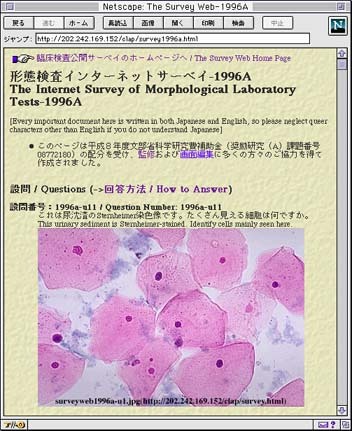 The Morphological Internet Survey Research Project Team, which consists of nine researchers from seven universities and 28 co-researchers from various fields of laboratory medicine and clinical pathology in Japan, was organized by the Ministry of Science, Education and Culture of Japan in 1998 to make a comprehensive study about reliability of the medical diagnoses made on digitized images (in detail, consult its home page at http://square.umin.ac.jp/survey/). 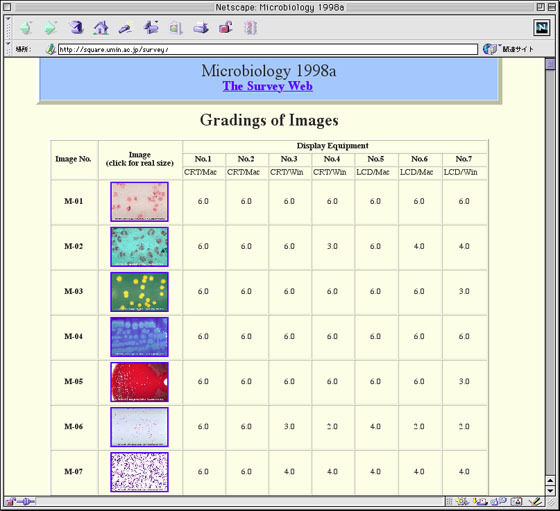 (1) Pictures of typical specimens from urinary tests, hematology, microbiology, immunology, physiology and pathology were digitized and the diagnostic reliability were evaluated using various display equipment including an extra high resolution (QSXGA, 200 pixel per inch) LCD. (2) The qualities of most of digitized pictures properly prepared were almost the same as slidefilms, but some of them must be observed with the QSXGA display to have sufficient reliability. (3) Besides, there were large variations in reproduction of colors among the displays, which may incidentally cause erroneous diagnoses (Fig. 4). (4) A lot of factors to be clarified before overcoming this problem, such as how to calibrating displays, application of color management technologies, influence of spatial resolution of displays, understanding medical decision making and practical feasibility of the solution, have been discussed. (5) As a temporary solution, a new calibration system based on a novel way of thinking has been developed. These displays have almost the same resolution, and the major difference among them is the performance of color reproduction. The highest grade is 6, and a grade less than 3 means unusable. Beyond prior expectation, grades of equipment No. 7 varied from the highest to unusable. Specimen M-01 etc. got the highest grade with every equipment, but specimen M-06 varied from the highest to unusable according to the equipment. Usually users look at only one display, so they cannot notice this fact, which may incidentally cause erroneous diagnoses depending upon the combination of medical images and displays.